The time it takes to list items for sale can limit listing volume. Locating tools on eBay's website can make problem-solving, feedback and communication painful and confusing. Shipping items can quickly chew through hours and cause negative feedback when sellers procrastinate or fall behind. Do these sound familiar to you? If so, set aside an afternoon for eBay performance enhancements and streamline your eBay selling life. Create a Library of eBay Bookmarks: In your browser's "personal toolbar" area, or just using your bookmarks menu, add links to all the resources you commonly use on eBay. For instance, visit the selling form, your Selling Manager summary, the Leave Feedback page, your lists of sold and unsold items, eBay's help page, the bid cancellation page, your seller performance rating, your sales reports and any other eBay tools that you regularly use—on eBay or beyond eBay—and add them to your bookmarks or shortcuts. Create a library of listing templates: Create listing texts in a word processor and save them in a dedicated eBay folder under the names of items. Copy and paste from these into eBay listing forms. Even if you don't list similar items repeatedly, parts of your listings, like shipping and handling terms, return processes and explanations of quality or condition ratings, can usually be stored to save time. Simplify your photo tasks: Change the photo settings on your camera so photos are taken at XGA (1024x768) resolution or lower so you don't have to resize photos. Install an easy-to-use photo management program like Google Photos, iPhoto or Fast Photos so edits are quick and easy and photos can be easily organized and reused. Use eBay's mobile apps: Mobile eBay apps, such as the one created for eBaying on iPhone, can considerably speed up listing and monitoring tasks for small and medium-volume sellers, and also let you manage your eBay life on the go. List using eBay's catalog: eBay's catalog pages don't just make your listings more professional and more accessible in search results; they also save you the time and effort normally required to describe and spell out the features and specifications of the item(s) you're selling. Consider using Turbo Lister: If you list more than a few items a week, the free Turbo Lister tool can save you time by offering bulk listing, built-in templates and the ability to post and edit listings in an application rather than in a web browser. Consider eBay Stores and Selling Manager Pro: Both eBay Stores and Selling Manager Pro offer bulk, automation and scheduling tools to lighten the load on growing sellers. Build and outfit a home eBay office: Set aside space in your home for eBay work to minimize distractions and equip it like an office. Use a cabinet, corner, desktop, or another convenient area for packaging and get ahold of the needed materials: a postage scale, scissors, tape, labels, bubble wrap or peanuts, boxes and/or padded envelopes and any other shipping equipment you regularly use. Keep your office clean and restock your shipping station regularly. Print postage online: Use PayPal shipping to pay for and print shipping labels at your shipping station. 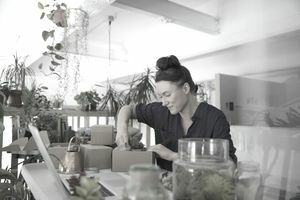 Then you can either schedule pickups for your packages or simply drop them off without ever having to stand in lines or speak to counter staff, and your buyers will be automatically sent tracking numbers. Get organized and offer great service and quality: Nothing takes more time than serving dissatisfied or worried customers, and nothing makes customers more worried than a disorganized seller. To minimize customer service time, transact and ship promptly and do your best to ensure that your customers never have a reason or need to contact you.